Kale is one of those vegetables that I’m experimenting with this winter. I find that like many greens, consumers are a little unsure oh how to make this leafy green tasty enough to serve for their families. According to WEB MD, Kale’s risk-lowering benefits for cancer have recently been extended to at least five different types of cancer. These types include cancer of the bladder, breast, colon, ovary, and prostate. Isothiocyanates (ITCs) made from glucosinolates in kale play a primary role in achieving these risk-lowering benefits. That’s a lot of goodness packed inside those green leaves. You can bake, saute or even roast Kale. Here is a recipe that a friend passed along to me that has become a favorite with my 2-year-old son. 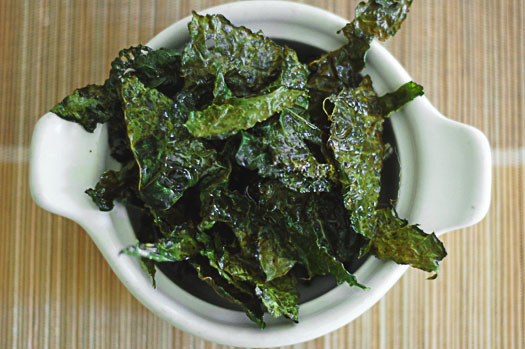 Kale Chips…provides that crunch of a chip and all the nutrition needed for a growing tot. Preheat an oven to 350 degrees F (175 degrees C). Line a non insulated cookie sheet with parchment paper. With a knife or kitchen shears carefully remove the leaves from the thick stems and tear into bite size pieces. Wash and thoroughly dry kale with a salad spinner. Drizzle kale with olive oil and sprinkle with seasoning salt. Bake until the edges brown but are not burnt, 10 to 15 minutes. Half way through sprinkle with Parmesan Cheese and return to over to finish baking.